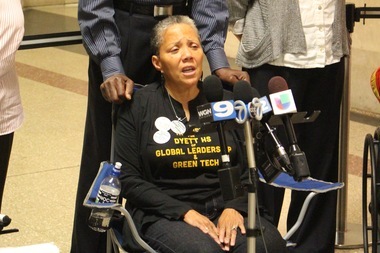 Dyett High School hunger striker Cathy Dale insists, "We are prepared to die." CITY HALL — The Dyett High School hunger strikers entered the fifth week of their protest Monday, with one insisting, "We are prepared to die." Several of the now 15 Dyett hunger strikers returned to City Hall Monday on their 29th day without solid food to call on Mayor Rahm Emanuel to at least have a "respectful conversation" with them over the future of the Bronzeville school in Washington Park. Since Aug. 17, a dozen hunger strikers have been demanding that Chicago Public Schools accept the proposal put forth by the Coalition to Revitalize Dyett High School to convert it into a Global Leadership and Green Technology academy. 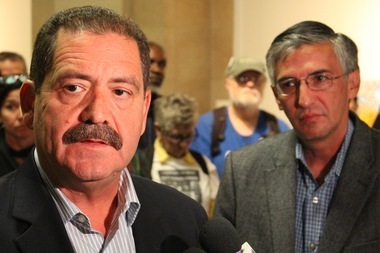 Cook County Commissioner Jesus "Chuy" Garcia and Ald. Ricardo Munoz compared it to a similar hunger strike in Little Village in 2001. They have rejected CPS' move to turn it instead into a neighborhood open-enrollment arts high school. "A compromise happens when two people come together and they work out together something that's agreeable to both parties," said Jitu Brown, a leader of the hunger strike, Monday at City Hall. "There was no compromise." According to Brown, he was told about the CPS plan 15 minutes before it was presented by Chief Executive Officer Forrest Claypool. Brown said he asked to continue to negotiate, but Claypool responded, "We're moving forward." "That's not compromise," Brown said. Brown said an art school "doesn't make sense," in that "the arts is not a growth industry," while green technology is growing. Yet CPS wasn't backing down, either. "As we announced on Sept. 3, Dyett will reopen as a neighborhood, open-enrollment high school in the fall of 2016," said Chief Education Officer Janice Jackson. "The new school concept was celebrated by a broad coalition of community groups, clergy, and elected officials representing Bronzeville and the larger South Side community, and it will incorporate key themes identified by the [Request For Proposals] process, such as a technology hub for the larger community, and the need for fine-arts programming that are consistent with the legacy of the school's namesake, Captain Walter H. Dyett." Hunger protester Cathy Dale, however, labeled the supporters of that proposal "vultures," calling them "the people who have sold us out." Jackson said the district has begun the process of selecting the school's principal, "who will play a pivotal role in leading the school as it begins its next chapter." Yet the Dyett hunger strikers are demanding a role in that selection and what Brown called "prominent seats on the school design team." Brown said he has lost 36 pounds on the strike. "This is a life-threatening situation at this point," added Erin Raether of Nurses for Social Justice, who has treated some of the hunger strikers during their fast. "They didn't look like this 29 days ago." Cook County Commissioner Jesus "Chuy" Garcia (D-Chicago) and Aldermen Susan Sadlowski Garza (10th) and Ricardo Munoz (22nd) lent their support to the hunger strikers Monday. "I find it really important that they be given a seat at the table when a decision is being made on a neighborhood school," Garza said. "Part of the problem is they've never been given a seat at the table to even have that dialogue." "It's important to recognize the struggle of neighborhoods to improve themselves," Munoz added. Garcia, who ran against Emanuel for mayor earlier this year only to lose in a runoff, compared it to a 19-day hunger strike Latino activists engaged in in 2001, which eventually produced Little Village Lawndale High School four years later. Calling a hunger strike a "protracted, drastic measure," Garcia nonetheless said it produced a compromise when "cooler heads prevailed on both sides." He called on the mayor to meet with the Dyett hunger strikers, adding, "Dialogue and face-to-face meetings can go a long way." The hunger strikers say they've gone without solid food, even as some have used protein shakes, juice, broths and sport drinks to keep their energy up. India's Mahatma Gandhi engaged in several hunger strikes in his non-violent protests in the mid-20th century, but the practice is probably best remembered from the early '80s, when 10 Irish Republican Army hunger strikers died in their fast to demand better treatment from the British government while in prison. Bobby Sands died on the 66th day of his hunger strike, while others lasted between 46 and 73 days. "We're not the ones bullying," Brown said. "We're the ones being bullied. And we're not the ones being unreasonable."